Switzerland – Failing to Deal with Too-Big-To-Fail? 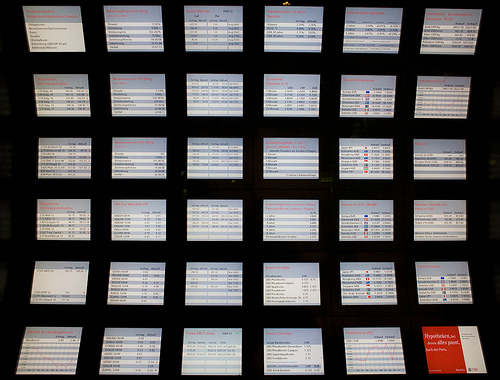 A lot of numbers to keep track of – stock market news at a UBS branch in Zurich. Courtesy of belpo/flickr. World-renowned for its delicious chocolate, accurate watches and safe bank accounts, Switzerland considers itself an island of political and economic stability at the heart of Europe. As a measure of success, the Swiss economy survived the 2008-09 financial crisis experiencing fewer devastating consequences than other industrial countries. Switzerland was not completely immune however, as the government had to come to the rescue of the financial industry in the fall of 2008. Fearful of the potential fallout if banking giant UBS declared bankruptcy, the Swiss government deemed it necessary to bail it out in October 2008. The rescue package included a $6 billion convertible bond issued by the government and the establishment of a fund, supported by the Swiss National Bank, into which UBS transferred toxic assets once worth around $60 billion. In view of an annual GDP of roughly $550 billion the Swiss public entered a huge financial risk by saving UBS. Since then, the Swiss economy seems to be back on track with slow but positive GDP growth. As immigration and energy issues dominate the media in anticipation of upcoming national elections, many seem to have forgotten about the complex and unresolved risks regarding the financial sector: Banks like Credit Suisse and UBS could still push the economy on the verge of collapse: They remain ‘too-big-to-fail” and profit therefore from an implicit state guarantee. An expert commission has put forward tighter regulations for the country’s banking giants in an attempt to prevent a repeat of the government bail-out. The expert commission proposals require equity to be tied to total assets in order to make systemically critical banks hold less debt. In a nut shell, lower debt-to-equity ratios are supposed to make banks safer. Moreover, the commission recommends that large banks should hold more liquid assets and prove that they can keep payment transfers and crucial financial services operational during times of crisis. On the basis of these proposals, the Swiss Federal Council has been working on revising Swiss banking law, which still has to be approved by parliament. In a first review the bill has been subject to profound criticism by political parties and it doesn’t seem as if they will be able to agree anytime soon. Referring to UBS threats to leave Switzerland for more business-friendly places, conservative parties argue that Swiss banks shouldn’t be subject to tighter rules than their competitors abroad. The political left, however, thinks that the new law still gives banks too much leeway. Whichever opinion prevails, the proposed law contains stricter rules than those suggested by the Basel Committee on Banking Supervision last year. Urs Birchler, a professor of banking at the University of Zurich, argues that – thanks to the new bill – Swiss banks will profit more from increased fiscal and economic stability than they stand to lose from higher equity requirements. And, highlighting the sheer size of the Swiss banks, Martin Janssen, a professor of finance at the University of Zurich underlines the importance of an effective revision of Swiss banking regulation: Relative to Swiss GDP, both UBS and Credit Suisse are ten times as large as the Deutsche Bank is compared to German GDP. Swiss politicians are not alone in having difficulties negotiating solutions: Governments all around the world cannot agree which remedies best heal financial woes. But Switzerland cannot wait for a comprehensive and balanced international solution to tackle its ‘too-big-to-fail’ challenge. Instead, Swiss legislators should overcome their differences and implement the expert commission’s proposal as soon as possible. Clocks, cows and chocolate won’t be able to save the economy should either UBS or Credit Suisse collapse during another major financial crisis.